Long known for being among the best DJ headphone creators, Pioneer has created the HDJ-2000 headphones. 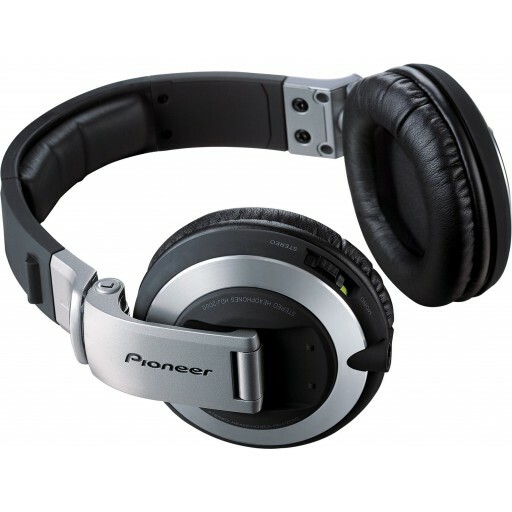 The newest in Pioneer's DJ headphones, the HDJ-200 has the high sound quality needed for professional use. With a driver unit featuring a diaphragm of the best material and optimal thickness, a voice coil for good balance from bass to treble, and a large, high flux magnet 2-inch in diameter, the HDJ-2000 pro headphones catch dance music beats (bass drums and cymbal rhythms) needed for DJ performances. - Made with a Soft Touch: The HDJ-2000's flexible protein leather has a soft, natural feel is used for ear pad/head pad surfaces that touch the skin. - Snug Fit: Low-rebound urethane foam is used inside the ear pads and head pad. Designed to fit over the shape of the head, maintaining comfort even in long sessions. * Minimizes stress on the head, ensuring comfortable DJ play with magnesium alloy components are used for the main body for both light weight and durability. With a new i-type hinge, a smooth and integral form has been achieved that naturally fits the hands at any moment during DJ play. The headphone's ear pads have a spun finish aluminum ring that matches the design of Pioneer CDJ player play/cue buttons, for a simple and stylish design. - Folding headphone: It folds into a compact configuration for easy carrying. - Carry pouch: It comes with a pouch for carrying. - Swivel mechanism: The housing turns 90 degrees for more convenient single-ear, on-shoulder, and various other monitoring styles. It automatically goes back to the original position after it is swiveled. - Click mechanism: It clicks into place to prevent inadvertent rotation or folding of the headphones during use.